I feel like Brussels sprouts used to be this cringe worthy vegetable that we were force fed as children. Just these green, brain-like balls of mush that we’d try to feed to the dog when Mom wasn’t watching. But today, it’s a whole new story. 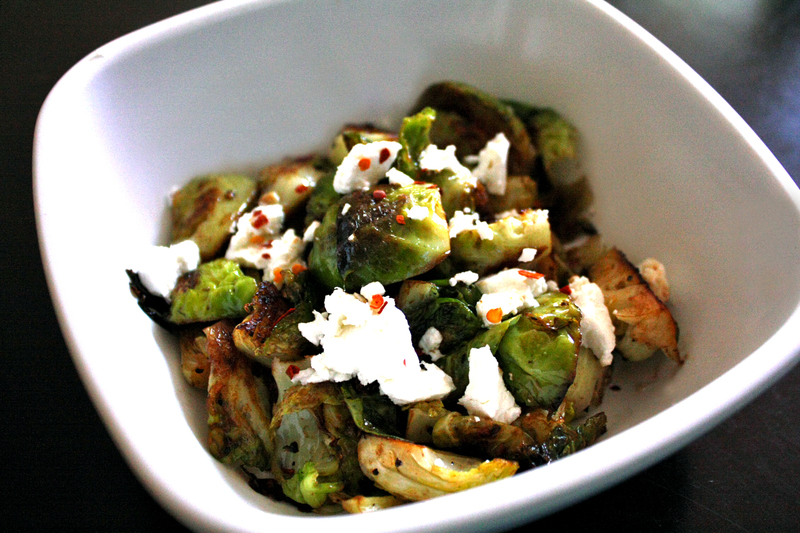 Brussels sprouts have blown up over the last few years, especially in the restaurant world. Almost every restaurant I’ve been to in LA serves the cruciferous veg as an app or side dish–including the place I work, which is where I drew inspiration for this dish. At The Overland (where I work) they flash fry the sprouts, but I sautéed them instead to lighten it up a bit. I also added red pepper flakes to give it a nice kick. In my opinion, everything is better with a little heat, but you can omit them if you’re a wuss. Kidding. The creamy goat cheese really brings this dish together, balancing out the acidity of the balsamic vinegar and the bitterness of the sprouts. If this doesn’t turn you into a Brussels sprouts lover, nothing will. Trim the sprouts by cutting off the bottoms and slicing them in half, lengthwise. You can quarter them if they’re really big. Coat a frying pan with olive oil and warm over med-low heat. Add the Brussels sprouts and cover. This will help soften them. After about 5 minutes or so, season the sprouts with salt, pepper, and red pepper flakes and remove the lid. Turn up the heat to med-high. This will create a nice char and crisp up the edges.Test a couple sprouts to determine their doneness–they should be tender overall, with crispy edges. Once they are finished cooking, remove the pan from the heat and drizzle with balsamic vinegar. If you don’t remove them from the heat the vinegar with burn and turn bitter. Garnish with goat cheese crumbles and more red pepper flakes (optional) and serve immediately.